In this well-researched work, Dr Alb n Masarik explores various features of funeral sermons arising from their unique context and homiletic process. While funeral sermons are an important element in pastoral care of churches and the wider community, theological reflection of this weighty responsibility can be hard to find. 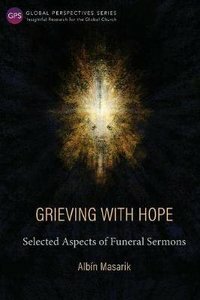 Addressing the definition of a funeral sermon, their categorization, purpose and context, this book brings clarity to inform the exercise of preaching a funeral sermon and help pastors and theologians grapple with how to best shepherd their flock and exalt our Saviour in the midst of bereavement. About "Grieving With Hope: Selected Aspects of Funeral Sermons (Global Perspectives Series)"